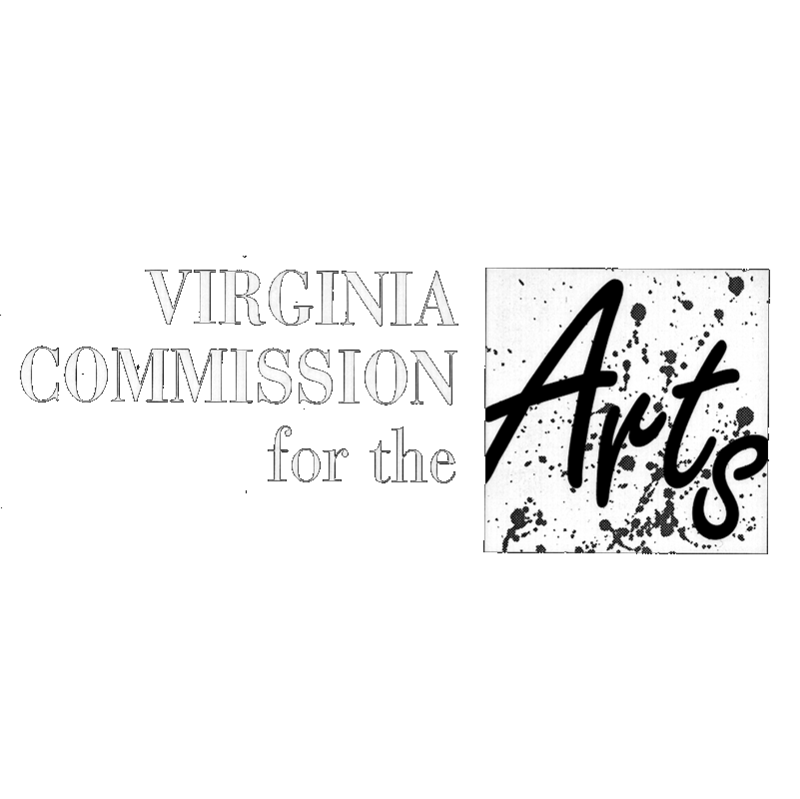 While the villainous Don John devises a scheme to shatter the nuptials of Claudio and Hero, the young lovers conspire to trick the utterly charming pair, Beatrice and Benedick, into admitting their much-denied love. 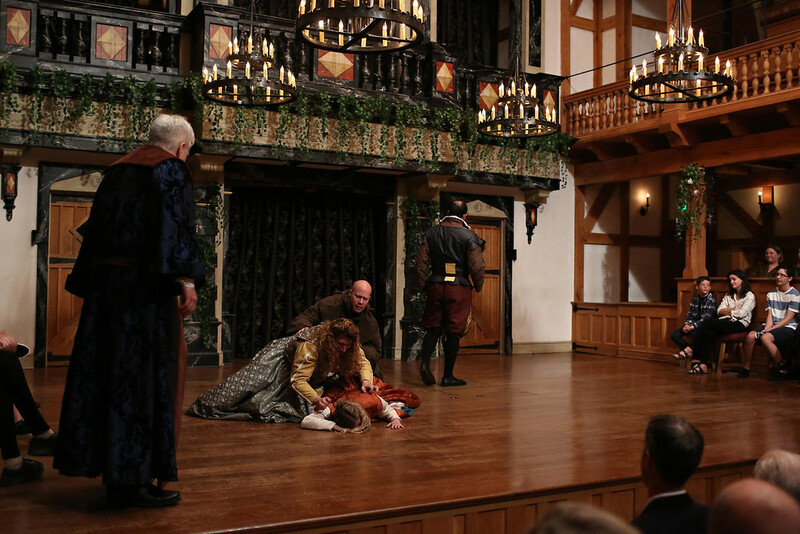 In this powerful comedy full of effervescent wit, Shakespeare gives us the joy of love won and the ache of love lost. He makes us laugh, breaks our hearts, and then magically puts them back together again. The cast of MUCH ADO ABOUT NOTHING. Photo by LINDSEY WALTERS. 2017. Greg Brostom, Josh Innerst, and Allie Babich in MUCH ADO ABOUT NOTHING. Photo by LINDSEY WALTERS. 2017. 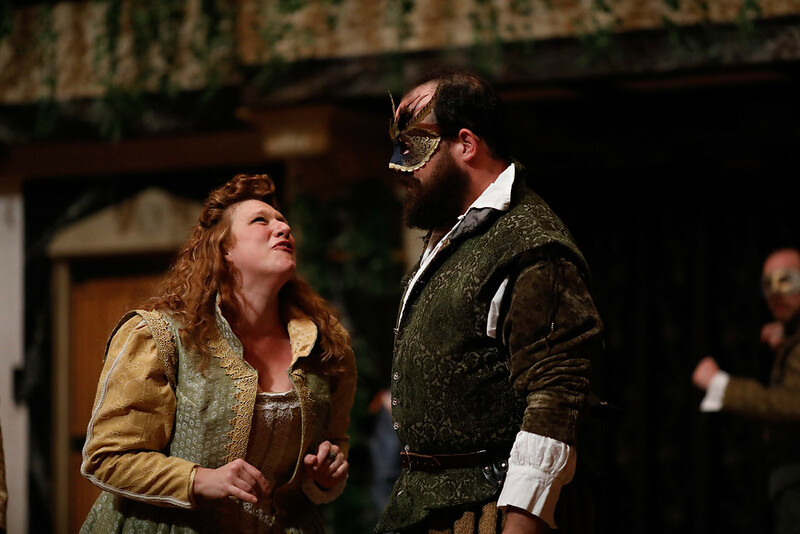 Christopher Seiler and Lauren Ballard in MUCH ADO ABOUT NOTHING. Photo by LINDSEY WALTERS. 2017. 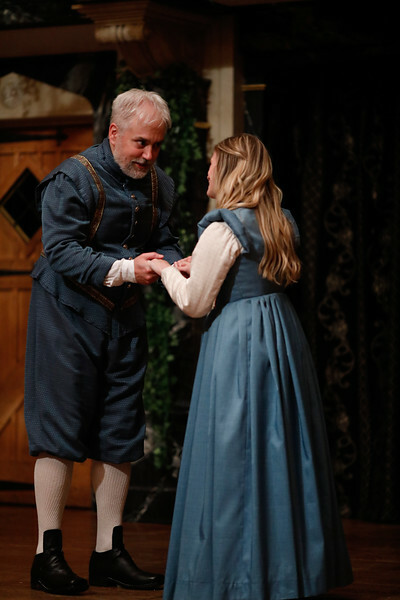 Allison Glenzer and David Anthony Lewis in MUCH ADO ABOUT NOTHING. Photo by LINDSEY WALTERS. 2017. Benjamin Reed, René Thornton, Jr., and David Anthony Lewis in MUCH ADO ABOUT NOTHING. Photo by LINDSEY WALTERS. 2017. 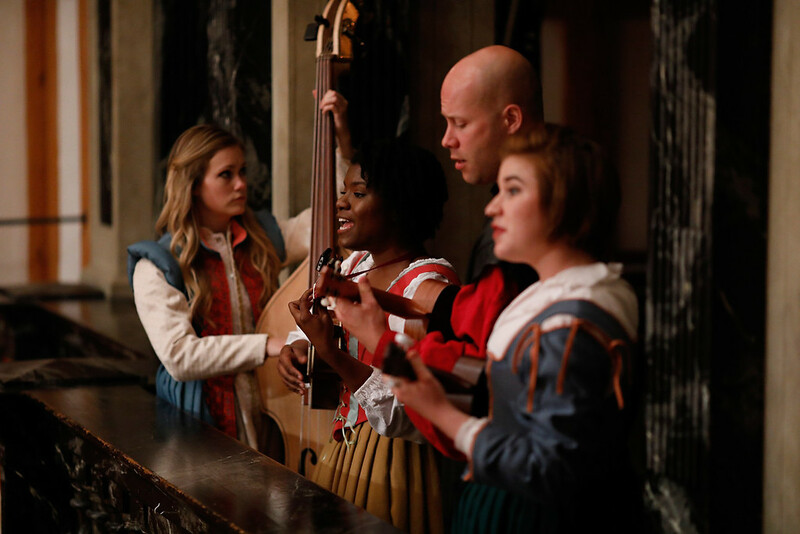 Lauren Ballard, Shunté Lofton, Greg Brostrom, and Allie Babich in MUCH ADO ABOUT NOTHING. Photo by LINDSEY WALTERS. 2017. 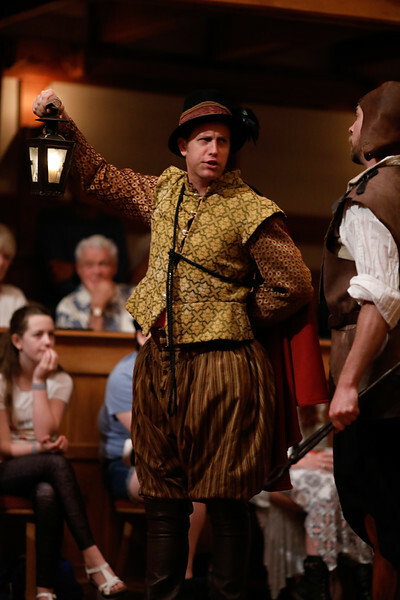 Chris Johnston in MUCH ADO ABOUT NOTHING. Photo by LINDSEY WALTERS. 2017. 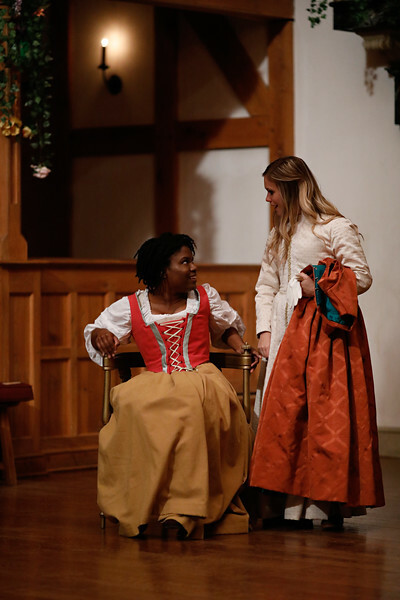 Shunté Lofton and Lauren Ballard in MUCH ADO ABOUT NOTHING. Photo by LINDSEY WALTERS. 2017. The cast of MUCH ADO ABOUT NOTHING. Photo by LINDSEY WALTER. 2017. Leonato, the governor of Messina, welcomes Don Pedro of Aragon and his troops after their recent military victory. 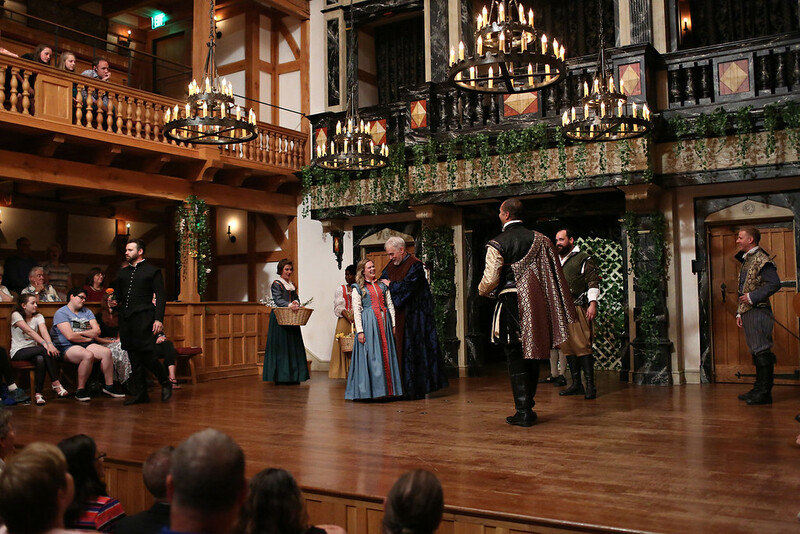 Beatrice (Leonato’s niece) and Benedick (Don Pedro’s friend) resume their “merry war” and verbally spar with one another. Both swear they will never fall in love. Claudio (Don Pedro’s younger friend) tells Benedick that he is in love with Leonato’s daughter, Hero. Benedick tells Don Pedro of Claudio’s love for Hero.  Don Pedro devises a plan in which he will pretend to be Claudio at a masked party, woo Hero for Claudio, and then get Leonato to give consent for Hero to marry Claudio. 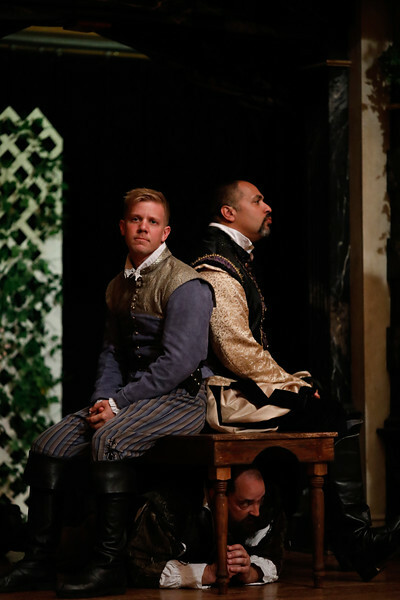 Leonato and his brother Antonio prepare for the evening party and mistakenly think Don Pedro wants to marry Hero. At the party, seizing his opportunity to get even with Claudio (whom he despises), Don John convinces Claudio that Don Pedro has wooed Hero for himself. 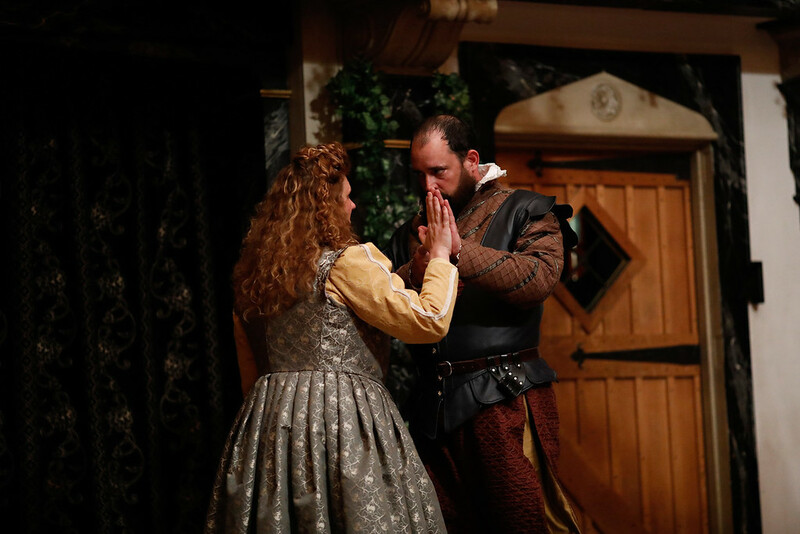 Don Pedro and Leonato clear the air when they reveal that Claudio may marry Hero. Don John devises another plot against Claudio in which Borachio, another of his men, will make Claudio believe Hero has been unfaithful. 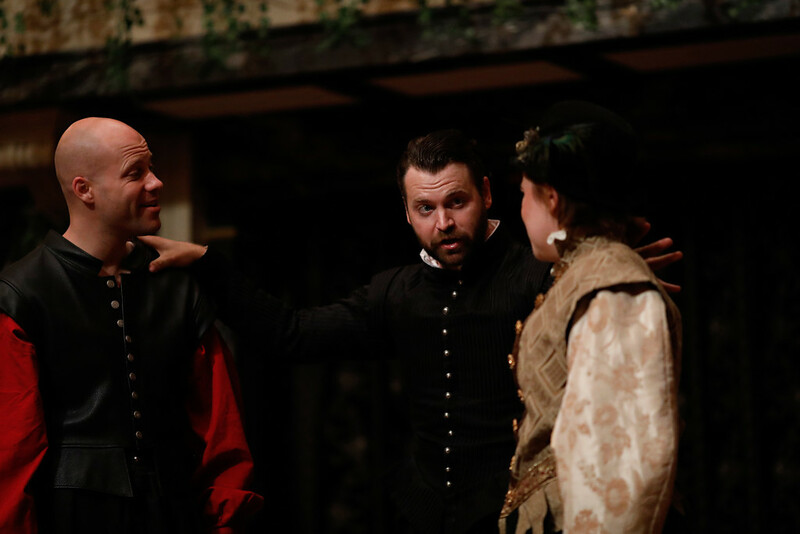 Knowing that Benedick is eavesdropping on them and thus will overhear, Don Pedro, Claudio, and Leonato pretend that Beatrice has professed her love for Benedick. Knowing that Beatrice is eavesdropping on them, Hero and her gentlewoman Ursula pretend that Benedick has professed his love for Beatrice. Don John makes Claudio believe Hero “is disloyal,” even the “night before her wedding day.” Claudio vows that if he should “see anything to-night why [he] should not marry her, tomorrow…will [he] shame her” after wedding day. Dogberry the Constable and his partner Verges prepare their watchmen for the night patrol. Borachio tells Conrad how he tricked Claudio into believing Hero was unfaithful. The watchmen overhear and arrest Borachio and Conrad. Before Dogberry and the watchmen can reveal the truth, Claudio rejects Hero and publicly shames her at their wedding; Hero collapses, Don Pedro and Claudio depart. Faked deaths, love vows, murder plans, and redemption ensue. We are always making Much Ado About Nothing. For good or for ill, folks love a good story. And we love the story *behind* the story – the inside scoop, the first report, the hot tip that will get us there first, best, most full of win (or at least not looking foolish). If a story is told enough, it becomes true enough. The wicked, the politicians, and the young have known this since time immemorial: a nudge in the right direction (towards something we hope or fear is, in fact, true) can turn a crowd into a mob, a hero into a chump, and a couple of nerds into the Romantic Leads. From nothing. Why, right now, maybe even in this Playhouse, a person catches the eye of another person, and in the course of offering the perfunctory nod, notices that in fact, all the light in the place seems to lead to that other person. Belly butterfly. Chest thump. Swallow. Look away. After a breath, they both look back at each other at the same moment, and though their cheeks might warm with a blush, still they keep looking and share their first, deep smile. There will be many, many more. We are always making Much Ado About Nothing.